To support our goals of promoting rugby in the central Virginia area and of trying to maintain at least one home and away fixture per season, we need your financial support. This year we are asking all the Gents to pay dues of $25/year. Our money this year is obligated to hosting requirements at the Porter Cup. We are not charging the Old-Boy sides an entry fee this year, yet we will pick up the referee costs, tourney hardware, and post match party costs for this event. This fall we host the Celtic festival rugby match. We acquired two sets of new jerseys last year through the generosity of our sponsors with a combined replacement value of over $2000. We need a steady influx of money to sustain that inventory. 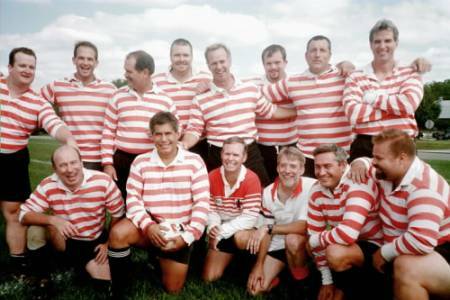 The old "candy stripe" jerseys will be awarded to anyone prepared to make a $25 donation (dues not withstanding) to the Club. These battle weary jerseys are a piece of old boy history and legend and were originally purchased in the 80's for the Va. Gents Ireland tour lead by Basil and Scott. This summer with sufficient interest and committment we can go to the Cape Fear 7's with a side. Beyond this year, we can take the Va. Gents as far as we ourselves are willing to take the Club. As of Jan 2002, we are in fairly good financial condition but we need your continued support. We currently have $600 in the bank. If we collect all our dues from the active membership, we will meet all our comittments for this year. As Old Boys, we enjoy our matches and the good times for sure, but the real lasting value of our organization is passing down the rich rugby tradition that we know to the lads and youngsters prepared to take on our sport. Our real worth rests in ways we can help grow the sport in Virginia, such as, assisting United RFC or James River RFC with administrative chores, holding office, referring, coaching, supporting the RRF, getting youth rugby started, recruiting players and sponsors, hosting visiting international players that wish to play for the A side etc. The ways we can help rugby are endless and can and should be tailored to your personal interests.